If you live in the United States, you need to pay taxes on your sweepstakes prizes. Each year, the IRS will expect you to declare your sweepstakes taxes on your 1040 form. Even non-monetary sweepstakes prizes should be declared on your taxes as "Other Income." If you are looking for a rough rule of thumb to figure out what the taxes on any given prize will be, I usually go with about a third of the prize value. So if you win a prize worth $9,000, you can expect your taxes to rise by about $3,000. But there are many factors which influence how much you'll have to pay on your prize winnings, so don't take this as a hard and fast rule. Note that you always pay taxes directly to the IRS, not to sweepstakes sponsors. One of the warning signs of sweepstakes scams is a request to pay taxes before you receive a prize. Here are the general steps to follow to pay your sweepstakes taxes. Good record keeping will make paying taxes on your sweepstakes wins so much easier. Keep a ledger or a spreadsheet where you record information about your prizes, including the name and sponsor of each contest you win, the date you expect to receive the prize, the date the prize actually arrived, the ARV, and the FMV, if you think that the estimated value of the prize is wrong. If you had any wins with a prize value of more than $600, you will receive a 1099-MISC form from the sponsor at the end of the year. Many sponsors will send 1099-MISCs for smaller prizes as well. You will need to include the information from these forms on your taxes, and you'll want to keep copies for your records. By law, sponsors must mail these forms by January 31st. Remember that you pay sweepstakes taxes on the Fair Market Value (FMV), not the sponsor's ARVs. If you have tracked the FMVs of all of your wins, use this amount on your taxes. You'll need to justify why your value differs from that on any 1099s that you've received from sweepstakes sponsors. There's a common sweepstakes myth that says you only have to report prizes worth $600 or more. This is not true -- all prizes, large and small, are legally required to be reported on US taxes. So you'll need to add together the value of all of your sweepstakes winnings throughout the year. That's the value you'll enter on your tax form. Enter the Prize Total Under "Other Income"
Once you have the total FMV of all of your sweepstakes wins, enter the value on line 21 of your 1040 form, in the section called Other Income. Here are the IRS' instructions on filling out the "other income" section of your 1040 form. Prizes and awards are mentioned on page 29. If you are planning to itemize your expenses as a hobby or as a small business, you should do it here. This isn't always considered a good idea. Speak with your tax consultant about whether this is a good idea for your circumstances. To be certain that everything is correct, ask a tax professional to review your filing. Sweepstakes taxes can complicate your tax return, especially if you have won a large prize. You want to be sure that you have not made any errors that will cause you to pay more taxes than you really owe. Finish filling out the rest of your 1040 form and submit as usual with your regular income tax return. 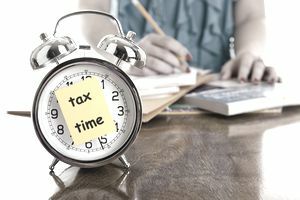 If you're spending money on stamps, envelopes, subscriptions to online sweepstakes sites, and so on, you might wonder whether you can deduct those expenses on your taxes. The answer is an unequivocal maybe. US tax law allows you to deduct the expenses you spend on a hobby from the income that you make with that hobby. So, if you are itemizing your taxes, you may be able to deduct expenses for postage, postcards, and sweepstakes newsletters from any winnings that you receive. To do this, however, you need to keep very good records. For one thing, hobby expenses are only deductible from the income that hobby generates. If you have $500 worth of wins but $600 worth of expenses, you can still only deduct against your $500 worth of earnings. If you have "other income" other than your sweepstakes wins, you must be careful to distinguish the different sources. Also, you need to keep good track of how you use the items you deduct. For example, if you buy $100 worth of stamps, you must be able to show that you spent all $100 on sweepstakes entries and none on bills or letters to your Aunt Bertha. Keeping your bills and receipts from all of your expenses is key to being able to show the IRS that your expenditures were legitimate. You also need to be scrupulous in reporting only expenses that are used for your hobby alone. For example, a subscription to a sweepstakes service would probably be deductible, but monthly bills for your internet would only qualify if you use the internet only for sweepstakes entry. Expenses that you deduct from your sweepstakes hobby are reported as miscellaneous itemized deductions on Schedule A and are subject to the 2 percent limit. If you are regularly turning a profit with your prize winnings, the IRS may consider you to have a small business rather than a hobby. If you are spending eight hours a day at your computer entering sweepstakes or spending all of your spare time filling out postcards for mail-in contests, then you likely need to file as if you have a home-based business. This still allows you to deduct more expenses, but it may also carry additional responsibilities. Many sweepers can answer these questions affirmatively. In short, your own specific circumstances have a huge impact on whether you can deduct your sweepstakes expenses. To make the right decisions for your circumstances, consult the IRS website and a professional tax consultant.